He's my brother's best friend. When my parents died, a part of me died along with them. Nothing mattered anymore; everything lost its meaning. I lived my life in moments, good and bad, but somewhere along the way, I stopped living. We only had each other, and Cade, he did a hell of a job looking after me. They doubted we could make it; they doubted our resolve. Braxton has lived next door to us ever since we moved in with my aunt after the horrific accident. Cade took to him so quickly; they've been inseparable ever since. Their favorite pastime? Torturing me. But something has shifted between us recently, and I'm seeing him in a whole new light now. I know my brother will never accept it, but he's drawing me in like a moth to a flame. Krista Pakseresht has always been a dreamer, from the first time she opened her eyes. Creating worlds through words is one thing she is truly talented at. She specializes in Young adult/New adult romance, horror, action, fantasy, and non-fiction under the pen name Kira Adams. She is the author of the Infinite Love series, the Foundation series, the Darkness Falls series, and A Date with the Devil. 5.0 out of 5 starsGive this one a chance! I am SO in love with this book! I couldn't put it down. It has amazing character build up. You find yourself sucked into the story as if these people are real and you know them personally. You want to smack the brother, but at the same time you love him. You want to hate the bad boy but just cant and are totally rooting for him, and I think a lot of girls will be able to relate with the main female character as well in many ways. Plus, who doesn't love a good love story that is a fight and struggle between the two characters to get to the romance part? I don't want to give anything away because you'll have to read it for yourself but Kira did a fantastic job on this book, just like every book of hers (in my opinion). This one has definitely jumped to the top of my favs list by her! I'm a huge Kira Adams fan and have read every book she's written. This may be the best book that she's written to date. I'm a sucker for a friends to lovers story with grit. Ms. Adams definitely delivers on the grit. The perfect balance of an obnoxiously overprotective twin brother, the guy next door who grows into a love interest, the ups and downs of being a band on the road. Throw in some heat, a little bit angst and this story blooms into an "ultimate" must read. *I voluntarily received and read an ARC provided by the author. Absolutely amazing. I couldn't put it down. I've always love Kira's books. This one is my all time favorite. I hope she is planning on writing more on these characters they are just so easy to love. 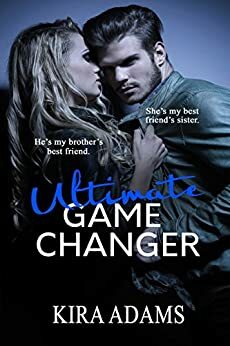 Ultimate Game Changer was a great book that I devoured in one sitting. Anytime there's a book about falling for a brother's best friend, well, it's filled with frustrating angsty goodness, as the push and pull kept me on the edge of my seat. Emerson and Cade are twins whose lives took a tragic turn that had them moving in next door to Braxton. Cade and Braxton became best friends instantly, and of course, throughout the years, Emerson started crushing on Braxton. But Cade is super over protective over her, and made it known that she's off limits to his best friend. Unfortunately, with feelings growing, chemistry shooting sparks, and secrets & lies all over the place, it's only a matter of time before things blow up. Kira Adams has a very talented writing style, as she drew me in from the very get go, and I was held hostage until the last page, so she's a new addiction for me. The secrets made for f-bomb dropping loudly all over the place, and boy did I drop em loud! I'm trying to be very careful so no spoiler douchery appears, but this is one of those stories that I just want to start breaking down page by page. With the gushing above, you may wonder why I only gave it 4 stars. See, I still have some unanswered questions that have me all kinds of jacked up, so hopefully there's another book coming out, so I don't lose my mind. However, since I'm jacked up with this issue, it proves that this author is awesome because I'm hooked. So I can do nothing less than HIGHLY HIGHLY HIGHLY RECOMMEND this addictive story to ALL! Emerson when her parents died her twin Cade and she had to move. Everyone thought they wouldn’t make it after the parents of Emerson and cade died. They wind up moving next door to Braxton and Emerson’s brother Cade demands that no one touch Emerson not even Braxton.